Byredo La Tulipe Soap and Body Lotion. Photo by me. 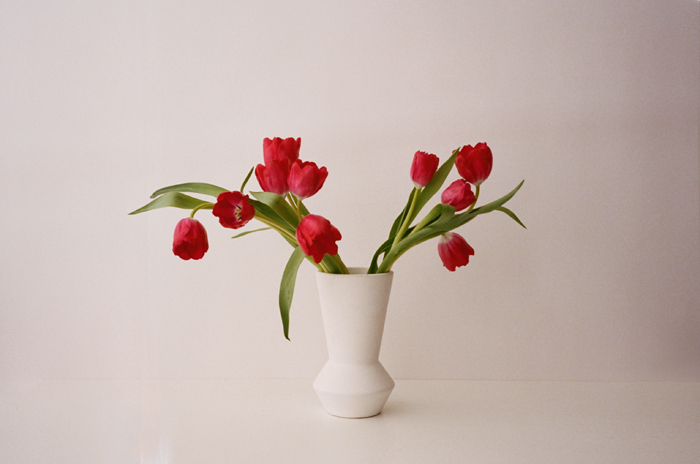 Red tulips in our studio, film photo by me. I’ve been a long time devotee to Byredo’s Gypsy Water and Accord Oud that I never looked into any other scents from the line. During pregnancy, especially in the first trimester, I had the typical sensitive aversion to smells. I had to temporarily shelve some of my favorite fragrances, so I unwrapped a gentle smelling bar of Byredo La Tulipe soap that I had received as a gift from a friend. I ended up really loving La Tulipe. In true form to its namesake, the scent starts out shy and then evolves throughout the day. It is super clean and minimal but still has that intangible sophistication you’d expect from Byredo. Products were not provided by the brand and there was no compensation involved. The opinions expressed are mine, I only recommend products I love and use myself. The links above are affiliate links, which means I may get a commission if you decide to buy the products through Net-a-porter.